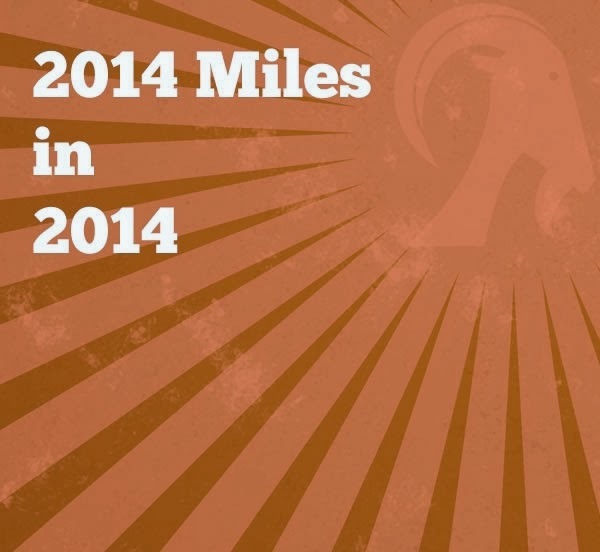 Half Way Point in 2014 miles in 2014 - June update! As its the end of the month and half way through the year it means it's time to tot up the total so far! Only 1073.29 miles to go! Only 441.72 miles to go! As you can see although we are at midpoint in the year my totals are a little lower than half the required distance. However, I am confident that once the Summer Holidays arrive and I start my next bout of marathon training I will make up the lost miles! I can't believe it's the last day of June and half way through 2014! I have been on a school trip today to The Sealife Centre at Blackpool so my energy levels were rather low this evening! However, I gritted my teeth and went to The Tri Club Swim Training session this evening. The focus was on technique drills as well as correct pacing. For the first 200 metres or so I felt exhausted but I soon got a new lease of life and felt great afterwards! I managed to swim 1900 metres or 1.18 miles or 76 lengths - I'm quite happy with that! On Friday evening I was going out so straight after work I went for a run! It was much cooler than it has been making it a very pleasant experience and I ran 4.54 miles at a 9.01 minute mile pace. On Saturday morning, after a late Friday night along with too much wine and pizza I went for another run! Talk about running on tired legs ... they were not at all impressed! I think I also must have been wearing my florescent pink invisibility cloak as there were several occasions when I was either on a zebra crossing or on a pedestrian crossing that the traffic failed to stop! I struggled during this run and my legs felt like they were running through treacle but I persevered and managed 8.19 miles at a 9:17 minute mile pace! After recovering from my run we went for a 5 mile walk before going to Ullswater to collect my Marshal kit for my marshaling duties at "The Day in the Lakes" Half Iron Man triathlon today! We conquered another Wainwright - Beda Fell, which was a lovely walk and very quiet! That only leaves 180 to go! Today I really enjoyed my first marshal experience! I was stationed about 30 miles in on the cycle route and had to make sure that cyclist's heading towards me turned left! There were some cyclists going at such speeds I thought they had no chance of getting around the corner but thankfully I had no casualties on my watch! I was amazed at how appreciative and friendly the majority of the competitors were and will definitely do it again in the future! I got to watch some great athletes in action and do a good deed for society all in one go! 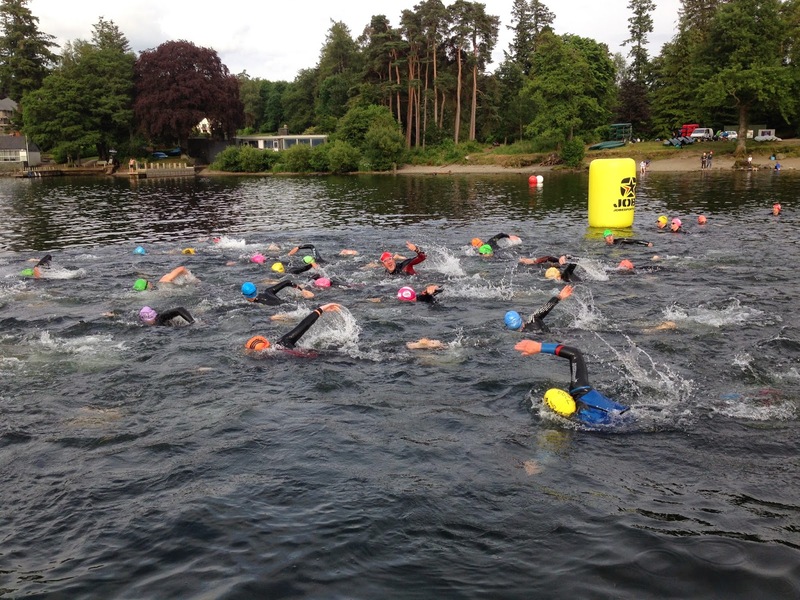 Tonight I went to the Open Water Training Session in Lake Windermere. This has become a regular training session for me over the last 6 weeks but tonight was the first time that the focus has been on a 1 mile timed swim! Usually it's a case of opting to swim as much or as little as you want! This is just what I needed to push myself instead of wallowing in the shallows after each 200 metre circuit having an extended rest! Although this wasn't a race I felt strangely nervous especially when I discovered that we would be doing a deep water mass start! Deep water start and a mass start are two of my greatest fears but I faced them tonight and did it! I hung back at the start really not wanting to be swum over and half drowned. Intially I felt very uncomfortable swimming and it felt too crowded but after all the other swimmers had got away from me I settled into my stroke and after the first circuit ended up feeling quite comfortable. I even tried my hand at drafting which I managed more successfully than I have done in the past! I wasn't as fearful of getting a kick in the face! It was very different to the once around the large loop circuit I did at the Great North Swim Mile. Tonight it was 8 times around a 200 Metre course which gave plenty of opportunity for sighting and turning practise! Sighting was quite difficult going in one particular direction tonight as the sun was very low reflecting off the lake giving very limited visibility however I was pleased with how I did and feel that I have come on in my Open water confidence immensely in the past 6 weeks! I have transformed from a nervous jibbering wreck to actually enjoying myself in the water and feel determined to improve further before the season is out! My official time for the mile was 38:00:42 which is 2 minutes faster than my Great North Swim time. However, I am beginning to doubt my counting abilities and perhaps I didn't go around the circuit the correct number of times! I am only doubting myself because people I know who are faster than me were slower than me in the results! I can't even rely on my garmin as the satellite kept being lost for some reason! It's been very warm lately and the heat seems to have drained all my energy leaving me with very little motivation for getting my backside into gear and running! 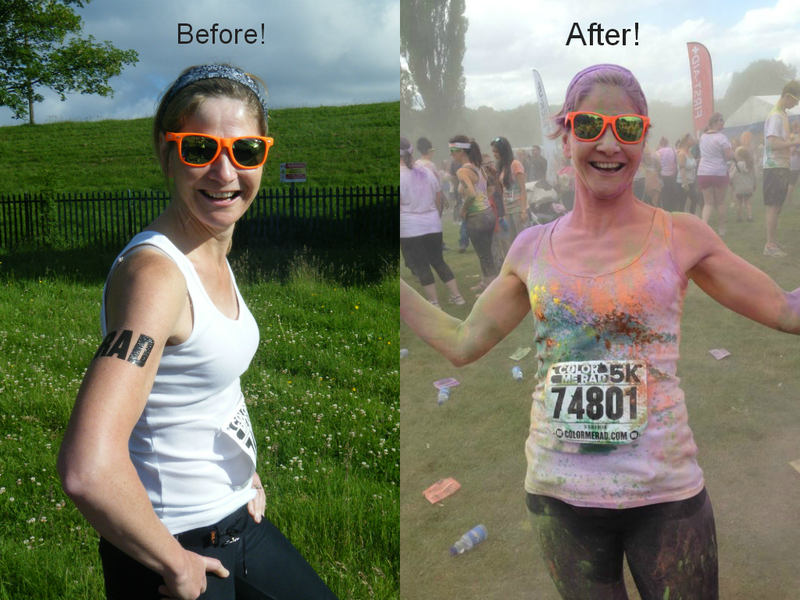 After Saturday's slow 5K Colour Me Rad run I was due to go on a long run on Sunday! It didn't happen! In actual fact a short run didn't even happen! The sun was shining so we decided to go for a fell walk to conquer some Wainwrights since our ticking off exercise seems to have become tediously slow! We headed into the Northern fells and took in Great Calva and Knott. We have now managed to climb 33 out of the 214 Wainwright fells, which means just 181 fells to go! It was a lovely day for walking and not too hot! All in all we walked 7 miles and only came across another 2 hikers the entire time! Now that's my sort of walk! After getting back home from the walk I didn't have any energy left to run so it was feet up time in the garden with a cold cider! On Monday I went to The Tri Club Swimming Session! It was an endurance session but instead of swimming sets of a certain number of lengths we swam for a set time instead! The session started off with 12 lengths as a warm up, then we swam for 2 Min's, 4 Min's, 6 Min's, 8 Min's, 10 Min's finally finishing with 8 Min's, having a 15 seconds rest in between each set. I found this very hard and was on high alert for the whistle the entire time! I managed to swim 82 lengths or 1.27 miles or 2050 metres. I wussed out of the cycle training this week! I felt completely exhausted after work on Monday and I didn't feel in the mood for being made to feel useless! Last night was The Tri Club Running session. Yesterday I had been on a school trip to Blackpool all day so I was feeling exceptionally tired but pushed myself to go as I hadn't run since Friday! Thankfully due to the others competing in a Half Iron Man this coming weekend they wanted a "steady" run! However, their steady usually equals my fast so I was delighted that I managed to keep up! We ran 4.58 miles off road and did some drills as well! Considering how tired I had felt beforehand I enjoyed it once I got going! I received my race number for Southport Half Marathon yesterday and I am very conscious that all my runs have been very short or non-existent recently! It's time to up the miles, although I haven't got long left! That brings us to this evening! It has been a much cooler fresher day today so I decided to try and do a longer run with a sprint mile slipped in! I set off probably a little too fast and did 1.67 miles as a warm up @ a 8:25 minute mile pace! I then did my 1 mile sprint circuit! I was hoping to be faster than the last time I did this circuit a month ago but unfortunately I was a couple of seconds slower and did a 7:41 minute mile! Maybe if my warm-up had been at a warm-up pace I could have got a faster mile pace! Afterwards I continued on my way and finished off with a 5.51 mile route! Altogether I ran just over 8 miles which is the furthest I have run in a while! 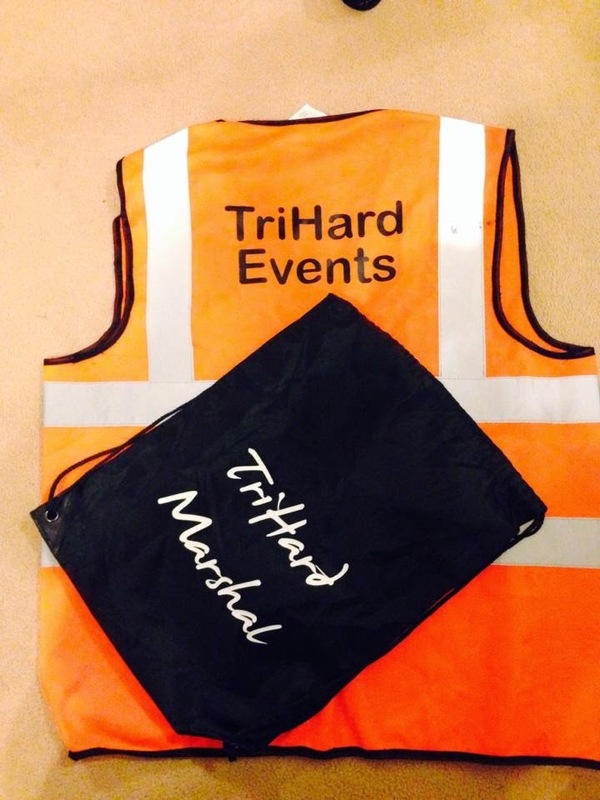 On Sunday I have my first ever marshaling duty! I am marshaling on the bike route of a Half Iron Man Triathlon and tonight I got my post confirmed and received my instructions! I am feeling very excited about it and it will be great to see the vast array of cyclists! I hope I don't mess up! Yesterday I ran in the Manchester Color Me Rad 5K race! You can read about this hilarious experience here! Straight after work this evening I had to help set up for the school summer fair so it had gone 5pm by the time I got home. After a quick coffee and after sorting tea my lazy hungry Horace's (aka son and daughter) I got changed into my running gear to hit the streets. It has been another hot and very humid day today and when I set out to run at around 6pm the sun was still shining and it still had a fair bit of heat radiating from it! My plan was to run for about an hour without worrying too much about pace! Slow and steady was the order of the day, but I still found it exceptionally hard work! I managed 7.22 miles at an average pace of 9:07 minute miles. Tomorrow should be a lot of fun! I am "running" the Colour Me Rad 5K in Heaton Park, Manchester. Watch out for some colourful photo's! No doubt there will be more laughing than running going on! It has been another hot and sunny day so I was looking forward to my Thursday evening training dip in Lake Windermere! What I don't understand is despite it being a fantastic day the lake was very choppy! How does that work? I was expecting clear, calm and warm waters! It was warm at 18C but certainly not calm however surprisingly - I was! This was my 6th lake swim and with each week that passes I get more confident and tonight it barely registered I was in Open Water except for the slap in the face every time I breathed to the left! But what a fantastic place to swim! I took it fairly easy and only did 0.65 mile but my arms are feeling extremely tired again! I think I might have to start doing some arm strengthening exercises if I am going to get stronger at this Open Water Lark! 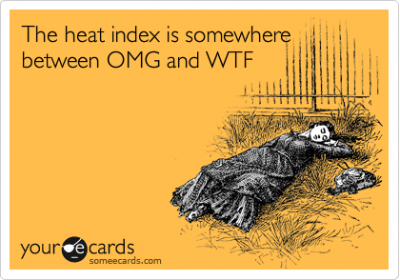 Us Brits always have to moan about the weather ... it's either too wet... too cold...too windy...too hot! 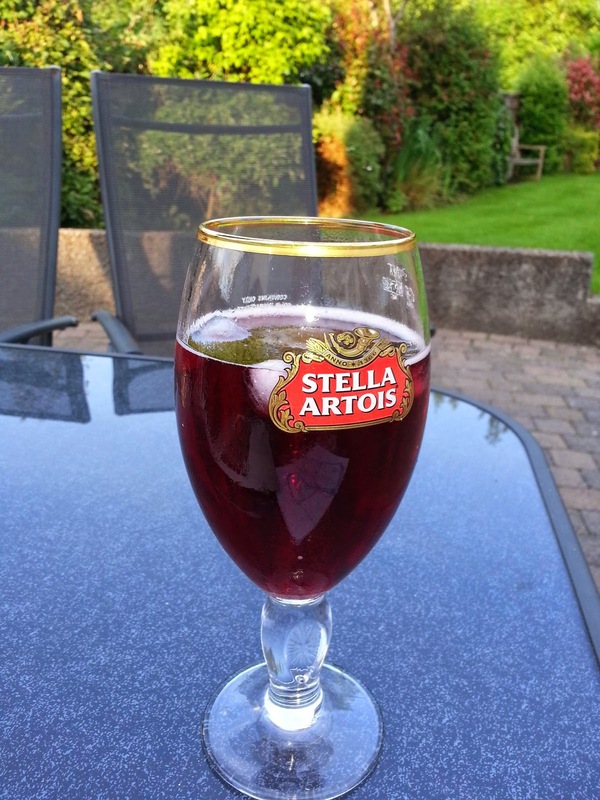 So I'm not going moan I'm just going to comment ... it's too hot and humid for running, but just perfect for having a cider in the garden! Another busy day at work with sports day and then a staff meeting until gone 6pm but thankfully I have slightly more energy than I did yesterday and didn't feel as weary as I did last night. So as soon as I got home I got changed into my shorts and vest top and the plan was to do some interval speed training. In hindsight this was a stupid idea in the heat but that is what I set out to do, so I did - in a fashion!! I discovered a feature on my Garmin 910XT that I hadn't used so wanted to experiment. This was the interval training workout mode. So I set it up to do a warm-up then 7 x 1/2 mile fast intervals with 45 seconds slow in between finishing with a cool down. The programme worked well but my legs didn't. After the first couple of fast intervals the fast became slow and the slow even slower! It was far too hot and extremely humid to be running fast! My only complaint would be that in interval mode you have no idea about the pace you are running so although I knew my fast was too slow I didn't know how slow until I got home and uploaded to Garmin connect unless I have overlooked a vital step when inputting the session in! I will have another peruse and see if I can get the pace to appear and then I will be a happy bunny! I was supposed to be running the fast splits at around 8:05 to 8:15 minute mile pace but only ended up with split 1 @ 8:05, split 2 @ 8:28, split 3 @ 8:30 ... and then it all went very wrong ... 9:24, 9:25, 8:52, 9:21! However I did manage to run 5.13 miles at an average pace of 9:21 so not all bad just not the speed I had wanted! Hey Ho tomorrow is another day! Tonight I managed to do a page in my Scrapbook for The Great North Swim! Still got to catch up on a few other races too! Here's hoping the weather remains hot tomorrow as I am going to go to the Open Water Training in Windermere despite the challenge being over - after all I had just started to enjoy it! After a very stressful day I really wasn't in the mood to go for a run this evening! I usually look forward to running to relieve the stress of the day, but this evening I felt so exhausted I hardly had the energy to lace up my trainers. I'm not sure whether its the effects of giving blood last night or being exceptionally busy at work that was to blame for my state of mind! Anyhow, usually I go to the Tri Club Running Club on a Tuesday night but after being made to feel like a crap cyclist last night I really didn't need to be made to feel like a crap runner too! I wasn't in the right frame of mind to run with fast runners and get left behind so I decided just to head out on my own and try and enjoy it instead! This was my first run in a week as last week I was concentrating on my swimming and saving my energy for The Great North Swim! Back to it tonight though and I expected to suffer for my lack of commitment and suffer I did! It was exceptionally hot and muggy and for some inexplicable reason I decided to go on a trail run - on hills!! Anyhow, I wore shorts and a vest top and took a bottle of energy drink with me and I'm glad I did! When I got home I looked like I had actually been swimming and not running and had drunk the entire bottle! I did 4.81 very slow miles, but I did it! I don't feel particularly good for it but lets be positive I must feel better than I would have if I hadn't gone! No more slacking from hereon in! Back to it as I have a Half Marathon to run on the 6th July! Not long to get my running legs back running! I can swim a mile in Open water, I can cycle 56 miles and I can run a Half Marathon! If I can just do them one after another I can do a Half Iron man! Is that a ridiculous thought? Yeah maybe it is! Perhaps I need to do an Olympic distance first! I gave blood this evening so I thought it was best that I didn't go to my usual swimming training! Didn't want to pass out under water! However, I did still go to the cycling improvement course! After enjoying it last week, I was back to feeling rather useless again tonight! We were practicing more group riding skills again and I have decided I am obviously best as a loner! I feel my confidence is at rock bottom now! I enrolled to boost my confidence and it has had the opposite effect! I think I will just keep practising on my own and hopefully improve that way! Great North Swim - I DID IT! 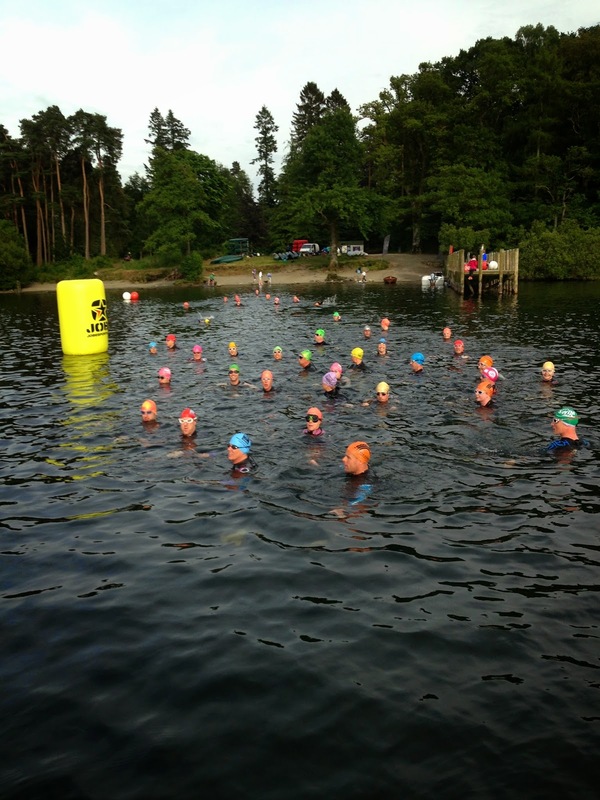 Yesterday I swam, finished and actually enjoyed my first Open water event - The Great North Swim in Lake Windermere! You can read about my experience Here! but I am packed and ready to go! Hopefully I haven't forgotten anything vitally important! 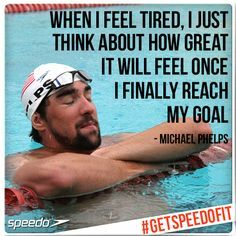 I have been reminding myself all day about how positive I felt last night after doing my final training swim! The weather forecast is still looking good so there is absolutely no reason for me to be worried! It's just a little swim in a big lake with lots of friends! It was full of race packs for my recently formed running group called "Off the Couch". We have entered our first race - The Colour Me Rad Manchester 5K which is a week tomorrow! I am sure it will be lots of fun and whether we walk/run, run or just walk the course, it has been a good team bonding exercise training for it! This is what was inside my own envelope! I wonder what colour glasses everyone else got? My next task is to find some old white clothes to run in! 2 days to go and one last ditch attempt! I didn't know whether to go training in Lake Windermere tonight or not but it was such a beautiful warm evening I couldn't resist and Emma, the swimming coach seemed to think it would be more beneficial for me to gain more open water confidence and experience at this stage than it would be detrimental to my tired body! So off I set with my main focus being on getting my breathing under control quickly and swimming front crawl from the off. I arrived just after 6pm to register and struggled into my wetsuit! Despite it being a fantastic evening it didn't seem as busy as previous weeks, but maybe everyone was saving themselves for The Great North Swim! Anyhow I held back until the main scrum had gone before setting off and the lake appeared positively tropical compared with how cold it's been in previous weeks! I set off with my new mantra "Bubble, bubble breathe" circulating in my head and I felt relaxed from the off! Just to confuse us we were swimming around the course clockwise tonight whereas in previous weeks we have swum anticlockwise. Apparently in the Great North Swim we have to swim the course clockwise with keeping the buoys always on the right so she was getting us familiar with that tonight! I can honestly say that for the first time I LOVED IT, LOVED IT, LOVED IT! I was disappointed that I couldn't just go for it and keep swimming but I was very conscious about wearing myself out so didn't want to push too hard despite feeling incredibly confident in the water! I only did 600 metres which is 0.37 miles so I should fresh for Saturday! Here's hoping I haven't peaked too soon and I have the same calm confidence on Saturday! I feel so much better about Saturday after tonight's positive experience! I truly believe I can do this now! I just need to keep the nerves in check! Last night I went running with the Tri Club. We headed off road and when we set off the weather was warm and humid but within 20 minutes the heavens opened and we got soaked! It rained for the remaining run but this didn't put us off! We still managed to do some speed intervals and drills! At one point I had to do an unexpected sprint when 3 cows decided to take exception to us going through their field! We ran 7 miles in total, with the speed intervals being very fast for me! Needless to say I got left behind on every occasion but they did lap back to pick me up! Tonight I went for a sports leg massage, just to be kind to my legs but by-gum it hurt more than usual! I think 2 trail races and a fast run last night must have taken their toll, but my legs are now like new ready to kick well on Saturday! 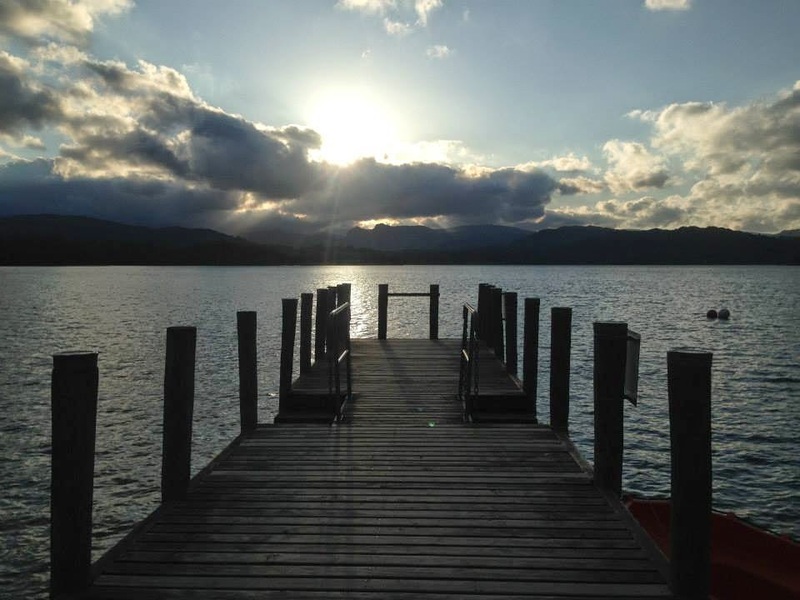 Apparently the water quality in Windermere has been monitored and its safe to swim in! Read the report here! Looks like I don't get out of The Great North Swim THAT easily! Thankfully the weather is looking fairly good for Saturday at the moment! Fingers crossed it doesn't change for the worst! I am determined to swim well on Saturday as I REALLY REALLY want to do Dublin Half Ironman in 2015! I will only consider entering if the swim goes well! 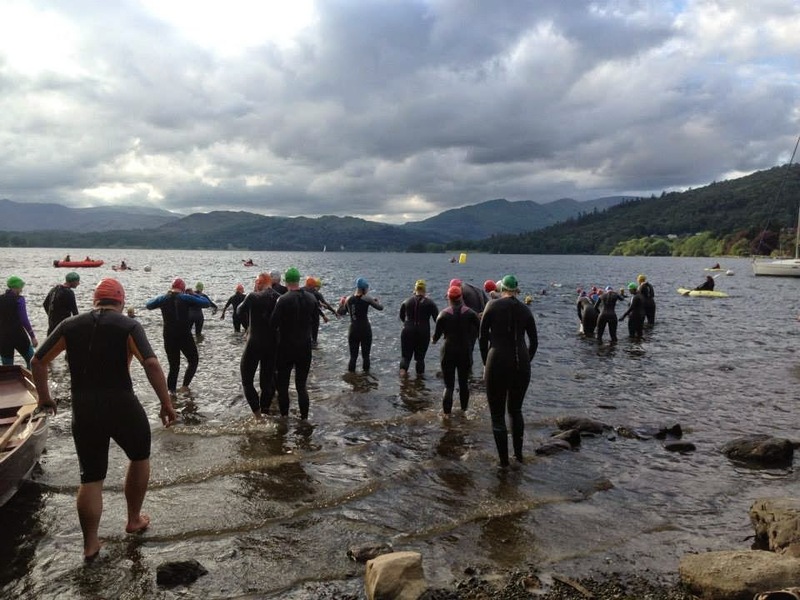 The Great North Swim is only 4 days away ... but thankfully it's 5 days before my time slot! I am swimming on Day 2 in the 3 day event at 9.30am on Saturday morning. I am trying to decide whether to go down on Friday after work to familiarise myself with the set up of the event and watch (hopefully pick up some tips) or whether this will add to my already very anxious state! Although my main goal on Saturday is to complete the 1 mile course and live to tell the tale I feel I need an approximate finish time in mind so my husband knows when to look out for me! I am finding this a fairly difficult task as there are so many factors to consider - such as the choppiness of the water on the day, the weather, the current, my ability to swim in a straight line, the crowdedness of my wave, my nerves and the water temperature to name but a few! My average pool swim time for 1600 metres or 1 mile is 35 minutes so with taking all the above into consideration and after much deliberation I have come up with a ballpark figure of 56 minutes. After an exceptionally tiring and extremely busy day at work I was secretly pleased when there wasn't any takers for the "Off the couch" running club! Everyone is either ill, busy or just not motivated enough to want to do it! After sitting down with a coffee at home I struggled to motivate myself to go to The Cycling Improvement Course! Last week I felt I was in need of much more improvement than everyone else and felt a little out of my comfort zone. Anyhow, I forced myself to go and really enjoyed it! Tonight's session involved group riding skills and etiquette including hand signals, peeling-off and pulling through! I felt that I managed to do most of the things fairly successfully if not perfectly! Straight after the cycling course I went to The Tri Club Swim Training! 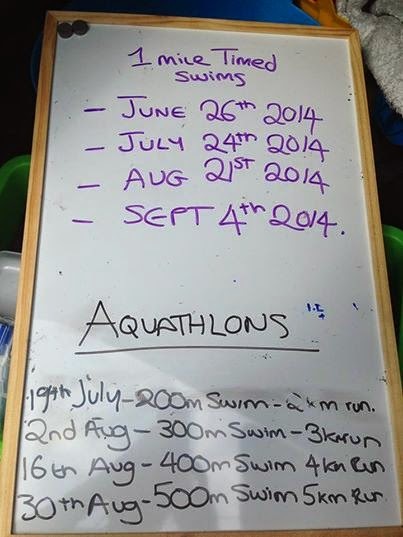 With just 5 days to go to the Great North Swim I need all the help I can get! Tonight's focus was on drills and speed training. I swam 1775 metres which is 1.10 miles. I CAN do this swim on Saturday although it has just been reported that there has been blue/green algae spotted in Lake Windermere recently! If this remains then the swim will be cancelled! YIKES! I have very mixed emotions on this! On one hand I will be saved from the terrifying experience ahead BUT will be very disappointed not to get the opportunity to prove I CAN! Read the news report here! The official times have just been announced for The Grasmere Gallop 10K Trail race and I finished in 58:48 which is slightly slower than my Garmin showed! However I am still very pleased with it as I was 8th in my age category, 28th female and 92nd overall out of 260 finishers! The full results can be viewed HERE! Wet through to my knickers but I did it! Today I ran in my second trail race and it couldn't have been more different to my first last week - weather wise! Last week I needed suntan lotion this week I really needed an umbrella, however I still managed to finish in under the hour which I am delighted with! Tomorrow I am running my second trail race and I am feeling ever so slightly nervous about it! I am running The Grasmere Gallop 10K race and I have just been reading the race reviews on Runner's World which was a big mistake! Although the reviews are very positive and everyone says what a fantastic race it is there are several mentions of wet feet due to running through the lake - I didn't sign up for that! Also just to make matters worse the weather forecast makes it an even more daunting task - heavy rain with thunder and lightening predicted! I suppose if this happens running through the lake won't bother me as I will already have heavy wet feet! Check back in tomorrow to see how I get on! I am setting myself a goal finish time of 1 hour 5 mins! Another week and another swim in Lake Windermere, but this time wearing my own wetsuit! I had ordered one off the internet and surprisingly it appeared to fit well and felt comfortable. However, just to be sure I asked the swim coach tonight at the training session to check the fit for me as I didn't want to make an expensive mistake. After a close inspection she also declared it a perfect fit! I arrived at Lake Windermere at 6pm in time for registration and the safety briefing. It was much colder out of the water this week and I felt chilled (and I don't mean in the relaxed sense!) even before I set foot in the lake! However, once in the water it didn't feel any colder than last week although it was much rougher and fairly choppy. Every time I turned my head to breath I got slapped in the face with a wave! During the first 200 metre circuit I wanted to cry, give up and go home! However I gave myself a good talking to - afterall I had just invested in a wetsuit, not the ideal time to decide OW wasn't for me! However, once I calmed myself down and settled my breathing I felt a bit more comfortable! I managed 6 laps of the circuit which is about 1200 metres or 0.75 mile. That is 400 metres more than last week so I must be getting better! 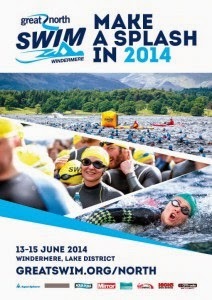 That will probably be my last opportunity to swim in the lake before the Great North Swim on the 14th June! I just need to survive an additional 0.25 mile! Feeling very nervous and scared sh**less! What was I thinking when I entered? I must lock my credit card away during wine o'clock in future!